The smartwatch that makes the most sense for Samsung owners to buy is the new Samsung Galaxy Smartwatch (R5,995 - R5,799). 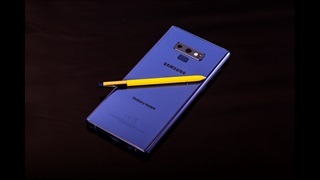 Syncing easily to apps like messages, calendars, alarms, Samsung Health, Samsung Pay, and more, it's a powerful and versatile smart companion to your phone. It works hard while maintaining a decent battery life and passing as a stylish analog watch - a couple distinctions the Apple Watch can't claim. Despite the constant pressure from my friends to convert to Apple, I like my Samsung phone. Occasionally, however, I've experienced some iPhone envy, at least with respect to its tight and seamless integration with the Apple Watch. After the Samsung Galaxy Smartwatch was released in the second half of 2018, Apple owners that started eyeing us with a new tinge of jealousy. A great all-around smartwatch, it boasts numerous features to keep you up-to-date on the notifications you care about, track your health, and much more - plus it has a battery life of longer than a day and a sleek, stylish look that doesn't scream "smartwatch." I've tried wearables like Fitbit fitness trackers as well as budget smartwatches under R5,000 but the Samsung Galaxy Smartwatch is by far the best I've tried yet, and I get why people would pay for a good wearable. Though the smartwatch is technically compatible with both Android and iOS phones, you'll have the best user experience if you pair it with an Android phone, and more specifically, a Samsung phone (I have the Galaxy S9). After I connected the watch to my phone via the Galaxy Wearable app, features like my messages, calendar, and Samsung Health app synced easily, but reviewers with iPhones or other Android phones reported some difficulties or glitches with syncing these basic features. Since it's not always convenient or appropriate to pull out my phone, I enjoyed the ability to access my digital life from my wrist, from replying to (or deciding to ignore) texts and calls, to skipping a song on Spotify, to reminding myself of the events I have going on that day. 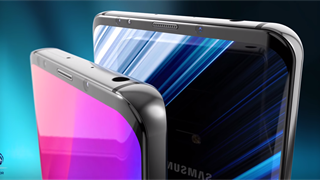 The Samsung Health integration was also helpful in nudging me - almost annoyingly so - to tear myself away from the computer screen and take a lap around the office floor, and to be more consistent about working out. Other cool uses of the Samsung Health app include stress tracking, sleep tracking, and guided meditation exercises. 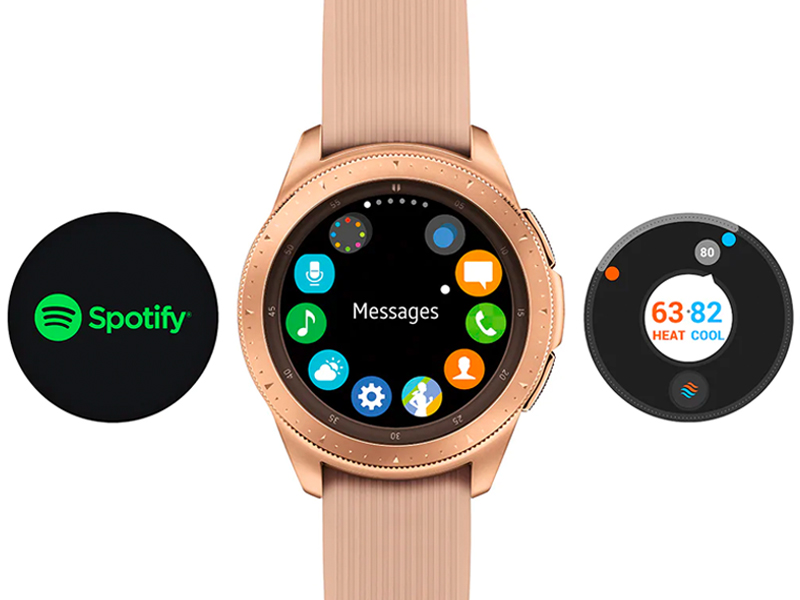 Making the smartwatch an even more powerful device are Samsung Pay and SmartThings compatibility. With Samsung Pay, you can travel light and simply use your watch to pay for purchases. Meanwhile, you can control smart home devices like security cameras and kitchen appliances from anywhere using the SmartThings app. 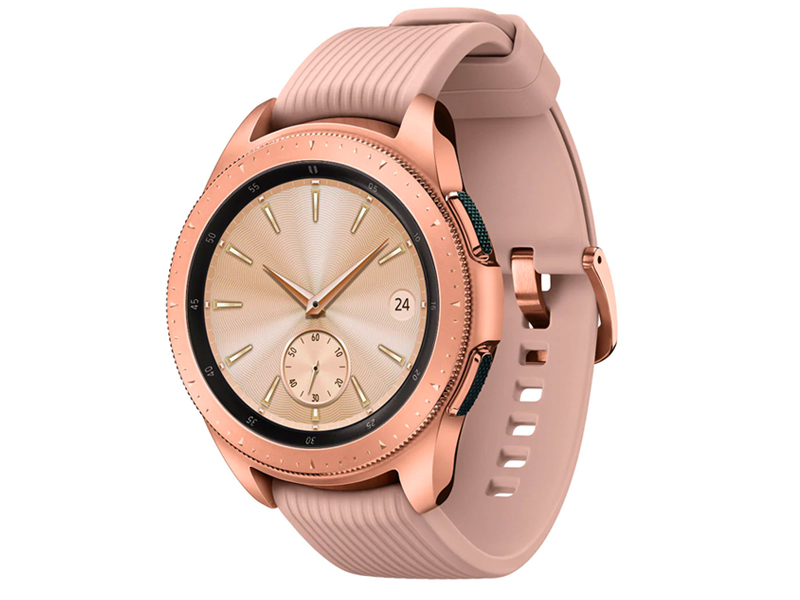 A big draw of this smartwatch is customizability, so I can't tell you the exact combination of apps to use or what watch face to choose (and there are a lot of beautiful and sleek ones to choose from! ), but I can say you'll never feel like there aren't enough options or that it's missing an important feature. While heavy use will affect the battery life, the battery is still surprisingly long-lasting. From what I hear from Apple Watch owners, they have to charge their watch every day, but I only have to charge my Samsung watch every few days. 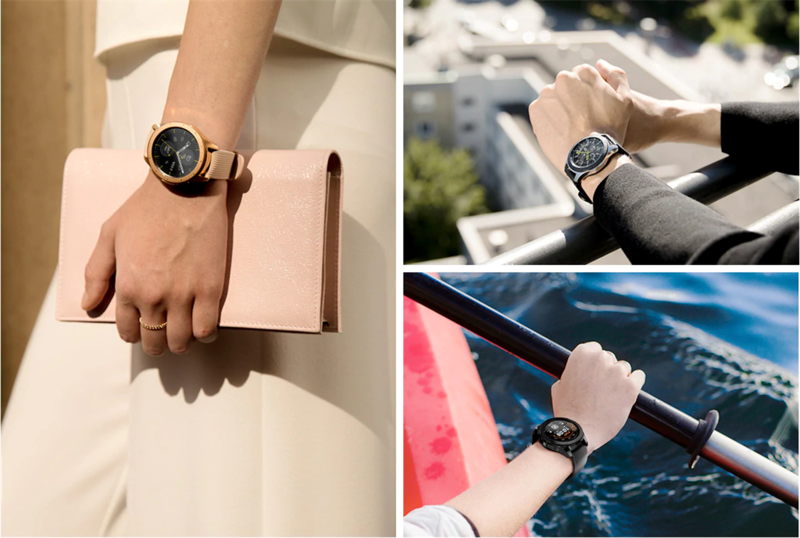 The 46mm version, with its 472 mAh battery, lasts even longer, for four to five days. If battery life is one of your biggest concerns and you like the Silver style, go for the 46mm. The rotating bezel bordering the screen also sets this smartwatch apart from the competition, letting you navigate through apps and screens without touching the screen. Concerning the clear and smooth display screen itself, you needn't worry about scratches because it's made from damage-resistant Corning Gorilla Glass. The entire watch is water-resistant, and its overall military-grade durability makes it a practical accessory to wear for everyday life. What makes a practical accessory even better is when it doesn't sacrifice aesthetic. 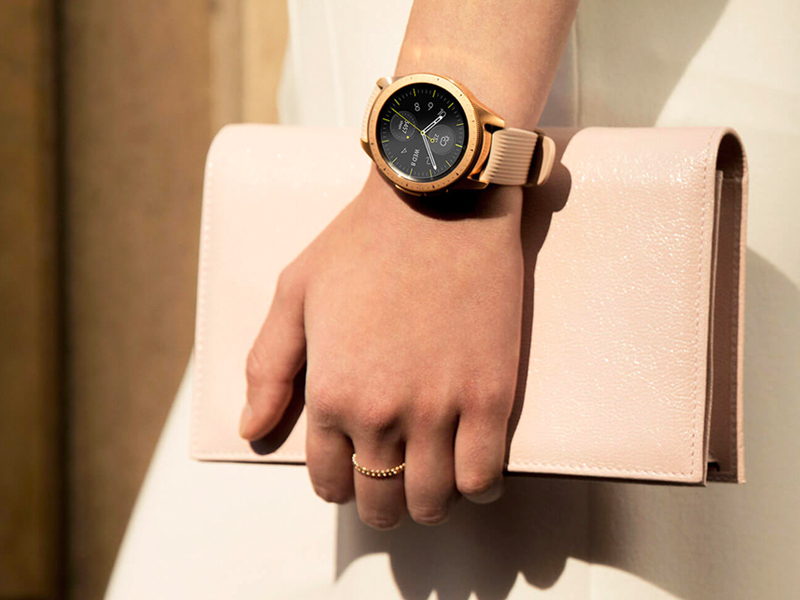 You can shop three different styles, like the pretty Rose Gold one above, none of which give away their advanced capabilities within. They also come with silicone bands that can be switched out to other styles and materials. It might've taken some time for Samsung to come out with a worthy Apple Watch competitor, but it looks like the effort paid off because you won't find another Samsung-geared smartwatch of this performance and style.